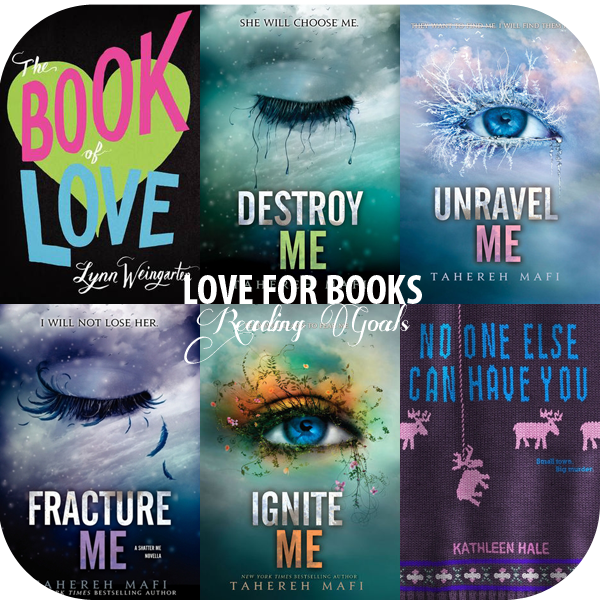 As I mentioned, last week I started on the blog, I am now participating in the Love for Books Readathon, which began yesterday and is hosted by Jessi at Novel Heartbeat and Amanda at Confessions of a Bookie Monster. I'm a bit of a slow reading schedule these past couple of days. On Sunday, two of my three full grown Golden Retrievers went running from the front of our house, all the way down our hallway, at full speed, to jump onto my bed (which is at the very end of the hallway) and pounce onto my bed while I was sleeping. They crushed an ankle that I broke less than two years ago and that took about 18 months to heal. We don't know yet if it's broken or sprained -- I'll know more Monday after an MRI. (Sometimes, the swelling keeps an x-ray from seeing a break. And sometimes, x-rays won't catch minute fractures and that sort of thing.) I'm also getting a special x-ray done that creates some sort of more accurate picture. I have no idea what that means, but I digress. The point is that since I'm in a lot of pain, I'm on a lot of pain meds and very sleepy, so I find myself reading slowly and also having to go back and re-read things a lot because my brain is just like "AJdlkjalkgjdalkf. English words? Does not compute." But late last week, before the injury, I finished Lynn Weingarten's The Secret Sisterhood of Heartbreakers, which is a spectacularly fun read (review to come soon). This obviously doens't count towards the readathon but yesterday, I began reading its sequel, The Book of Love. I'm only a few pages in because I got super dopey after I started reading it, but already, it seems just as fun as the first book. Obviously, there's a bit of a theme to this reading list. I started reading the Shatter Me series back in early December. I coach cheerleading here in Michigan, and that was right at the beginning of the start to our competitive season, so it took me a VERY long time to finish it -- like a whole month. That never happens. I am usually a book in a day kind of girl, unless I'm very busy. Then it's a couple days. I also think that part of my slowness was due to the fact that it was the first series I began since I finished reading Allegiant, which I love, but simultaneously broke my brain. So I'd kind of lost a little faith and was only reading standalones. But since I finished the Newsoul trilogy, my faith has been restored (see my review of the truly awesome Infinite by Jodi Meadows here), I am very excited to continue with this trilogy and the novellas, and I'm excited to see where it goes. I've heard lots of great things and general glowiness (new word?) throughout Twitter and blogs and the like. I'm halfway through the novella Destroy Me, which is where I will start. I started reading No One Else Can Have You early in January. As most of you know, then I got super sick and was in and out of the hospital with bad bronchitis that was nearly pneumonia, and I was sleeping like 20 hours a day because I was just so exhausted. Then Infinite came out and threw me off course. If I can finish all of those books between now and Sunday (which is very doable for me), it takes down the amount of books I am currently reading substantially, which would be awesome because my list of "currently reading" books on Goodreads is daunting and keeps staring at me with a nasty face like, like it's thinking I am a commitment-phobic-book-worm. If you haven't already head over to Novel Heartbeat or Confessions of a Bookie Monster and sign-up. You can sign up for it whenever you like, but if you do it by today (February 18) you will still be entered for the giveaway!